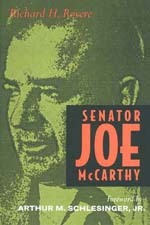 The story of Senator Joseph McCarthy's rise to unprecedented power and the decline of his influence is a dramatic one. Richard Rovere documents the process by which a clever, power hungry individual came to mislead and manipulate members of Congress and the American public and to damage countless lives. A new foreword for this edition by Arthur M. Schlesinger Jr. places the book in historical context and relates it to current issues in American public life. Richard H. Rovere (1915-1979) was a New Yorker staff writer, Washington correspondent for 11 years at the time he wrote this book. Among his books are Affairs of State: The Eisenhower Years and, with Arthur M. Schlesinger Jr., General MacArthur and President Truman: The Struggle for Control of American Foreign Policy.